I’ve always been in love with things related to France – French language, French food, French wine and French cities. 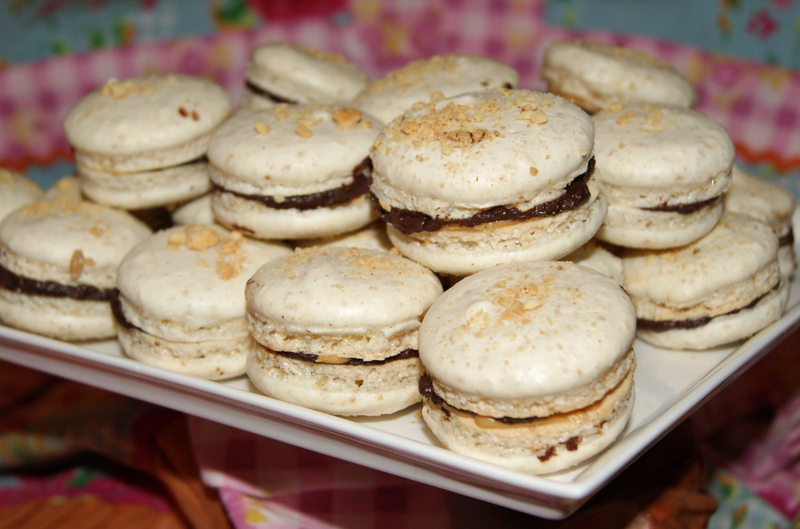 When I started seeing French macarons around the blogging world, I knew I had to make them. Luckily, we found out that we are going to have a SNOW DAY, so it seemed like the perfect time to try these rather complicated French delicacy. After eating several of them, I can honestly say that these little treats are divine. I really wasn’t sure what to expect because a no flour, egg white base sounded a lot like meringue cookies to me, which I happen to dislike. But these treats are crispy on the outside and almost like cotton candy on the inside. I even liked the plain cookie without the filling. I learned pretty much everything I needed to know in this tutorial, which I found via Annie’s Eats. But I have a few comments. Also the original recipe called for blanched, unsalted peanuts, but I accidentally bought roasted, salted and they worked fine. I used 2 silicone baking mats to bake these on (which my brother John introduced me to for my birthday). They are awesome for anything baked in the oven and I would definitely recommend buying one! Weigh all ingredients. Combine almonds, peanuts and powdered sugar in a food processor and process until smooth. In large bowl beat aged egg whites on medium-high until foamy. Slowly add the granulated sugar to the eggs and beat on high until stiff peaks form. Be careful not to overbeat. Then carefully fold in the almond/peanut/powdered sugar mixture until the mixture seems consistent throughout. Line 2 baking sheets with silicone baking mats, (or parchment paper if you don’t have silicone mats). Spoon the batter into a pastry bag or Ziploc. Cut the edge of the bag to leave an opening of about 1/2 inch. Pipe the batter into small rounds about 1-2 inches wide on the baking sheet. Leave about 1 inch in-between cookies, although they generally do not spread. Now quickly sprinkle with chopped peanuts. Then let the cookies sit for about an hour at room temperature. Once a cookies have started to develop a hard shell, preheat the oven to 300 degrees. Bake the cookies for 11-14 minutes. Remove from oven and let cool on pans. Place in an airtight container until you want to fill them. Place the chocolate in a heat proof bowl. Heat heavy cream and butter in a small saucepan over medium heat until it begins to simmer. Pour over chocolate and then stir until the mixture becomes smooth. Let the ganache cool until easy to handle. Transfer to a pastry bag fitted with a medium tip. Add peanut butter to another pastry bag also fitted with a medium tip. This entry was posted on February 2, 2011 by Spice Is Nice. It was filed under Cookie, Dessert .